Sherita Dixon Cole's story is getting little to no media attention. Activist Shaun King is shining a light on a story that is getting little to no media attention. 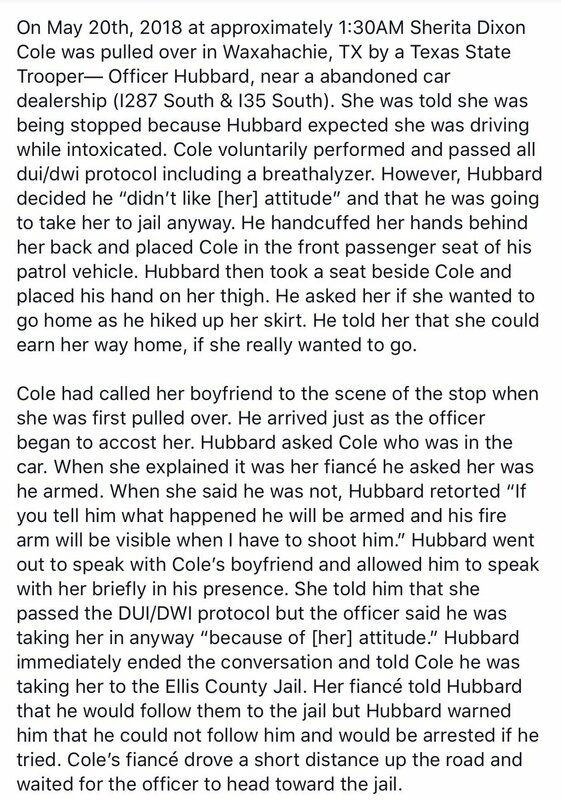 According to the post from King, Cole’s boyfriend “arrived just as the officer began to accost her.” She said he was armed and Hubbard reportedly said, ‘If you tell him what happened he will be armed and his fire arm will be visible when I have to shoot him.’ Hubbard went out to speak with Cole’s boyfriend and allowed him to speak with her briefly in his presence. She told him that she passed the DUI/DWI protocol but the officer said he was taking her in anyway ‘because of [her] attitude. '” Her boyfriend wanted to follow them to the jail, but the officer allegedly said he would be arrested if he followed. According to King’s posts, Cole reported being sexually assaulted but she was still held in jail. She is reportedly in the hospital now for the assault. King is asking that “the arresting officer in this case have all of his clothes from this shift fully tested for bodily fluids. It is our belief that they held Sherita for nearly 24 hours without cause to attempt to cover up this assault.” King also reports the officer deleted all of his social media. There will reportedly be a press conference today. We will keep you posted as more info surfaces.